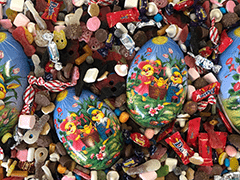 Liquorice – licorice – lakrids – lakrits – lakris; as we say in Scandinavia – dear child bears many names. It doesn’t really work in English, but the point is – we love liquorice. Scandinavians’ love for salty liquorice is unparalleled. The stronger and saltier the better! As many of the better things in life – it takes a little practice to get used to. But once you’ve got the taste for salty liquorice there’s no going back. A little bit of background info on Liquorice – liquorice, or licorice, comes from the liquorice root. It is basically a vegetable and counts towards your 10 a day. 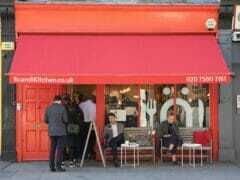 OK, not really (although if ketchup does..) – but it has in fact been hailed for its medicinal powers for centuries. Commercial liquorice is pretty far removed from its virtuous medicinal roots, but nevertheless worth knowing so you can console yourself if you overdo it on the black stuff. And did you know – pure liquorice is an astonishing 20 times sweeter than sugar? Now you do. A reminder from our previous post about liquorice; when talking about salty liquorice what we usually refer to is Salmiakki. 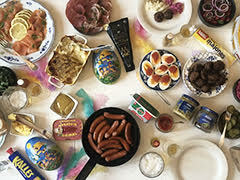 The word Salmiakki is a Finnish word. We prefer using that because the actual word is Ammonium Chloride, which doesn’t sound so nice. Ammonium Chloride is a powder that tastes salty, but isn’t the same salt as you sprinkle on your eggs in the morning. It’s this stuff that gives some of our liquorice the distinct edge – a salty/hot/spicy completely unique taste. 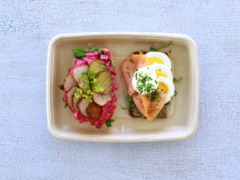 But let’s just call it Salmiakki, shall we? Or saltlakrids, if you want to be specific about it. Enough talk – let’s have some liquorice! Here are our top 10 liquorices in no particular order – we love them all. 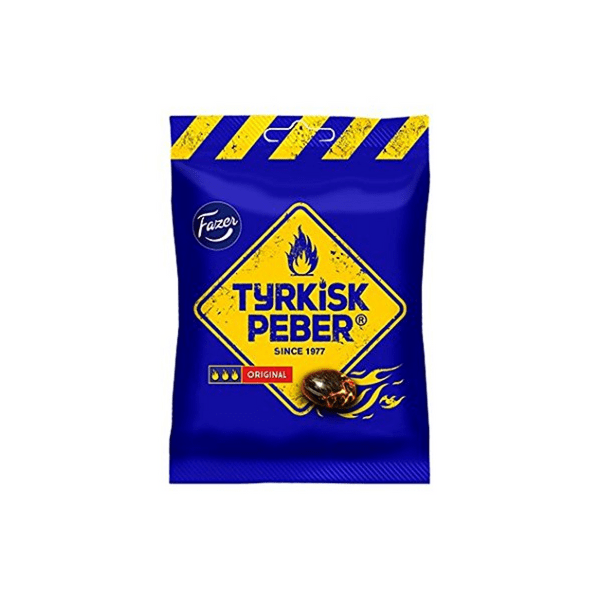 Probably the most famous Nordic liquorice, the recognisable blue bag with flames comes from Finnish Fazer. These babies are boilt liquorice sweets with a seriously salty powdery centre. Addictive to the point where you’ll need to restrain yourself to keep your mouth intact. Strong stuff. Aside from eating (too many) as they are, they are delicious to crush up and use in baked goods or a bottle of vodka – leave for a week or so for a delicious salty liquorice vodka. Great for shotting (famous last words). 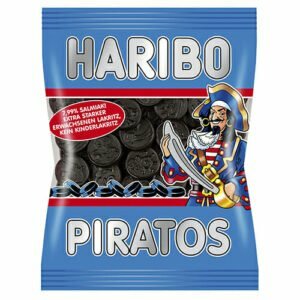 A Danish classic, we are not quite sure why these are called Piratos (pirates) – perhaps because the sea is salt and dark? Erm we don’t know – let’s move on. Salty, chewy coin-shaped liquorice sweets that are less aggressive than the two above. They have been around for 40 years(!) and are still one of the most popular liquorice sweets out there. ‘French Salt Pastilles’ – these are dainty and pretty on the outside (perhaps that is why they are French? We don’t know). The cute exterior gives way to a lovely and slightly salty liquorice centre – this is a good beginner’s salty liquorice. Danish gourmet liquorice made in small batches in their Copenhagen workshop. A truly premium product that comes in many varieties, both sweet and salty, with chocolate or without, and a range of limited editions depending on season. A great gift and an indulgent treat! Also known as Salta Sill; salty liquorice fish. 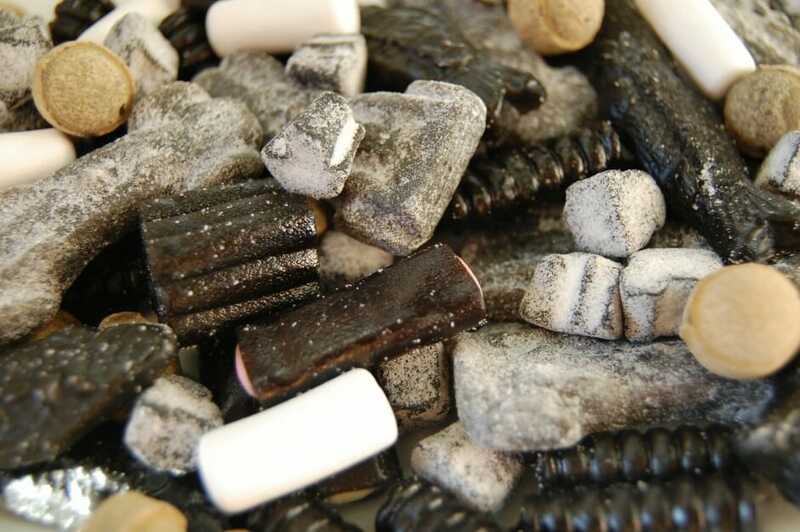 Another classic and best seller, salty fish are a welcome addition in any liquorice lover’s pick’n’mix selection. Another good beginner’s choice – it is salty and strong without being too intense. Also they look nice. 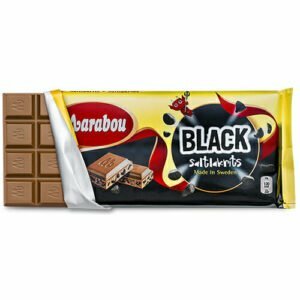 Salty liquorice milk chocolate, oh my.. This is one for true lakriphiles (did we just make up a word?). 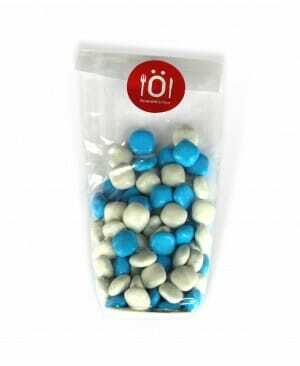 The salty liquorice pairs beautifully with the smooth, sweet milk chocolate, and the result is a seriously addictive treat. May take a few bites to get used to, but the combination sweet, salty, creamy and crunchy liquorice and chocolate is truly irresistible. If you like salty liquorice, that is. Chalks! Every child’s favourite sweet, because it is perfect to play with. Great for fooling grown-ups with.. Just tell them they are actual chalks and you’ll get to keep the bag all to yourself. Past the innocent white exterior is a sweet, mildly salt chewy inside that is a genuine crowdpleaser. Our Rebekka loves these. LOVES them. Tiny salty liquorice sweets in a handy box. Marketed as essential for a good singing voice. We haven’t noticed any improvements despite eating lots so we’re not sure this claim holds up – but delicious they are. Perfectly balanced between sweet and salty; a great introduction to salty liquorice. We like to keep a box handy in case of liquorice emergencies. Or, you know, for singing voice emergencies. 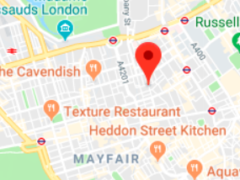 That is it – but far from all – to browse our extensive range of liquorice, visit our online shop here or come visit our central London shop (find us here).